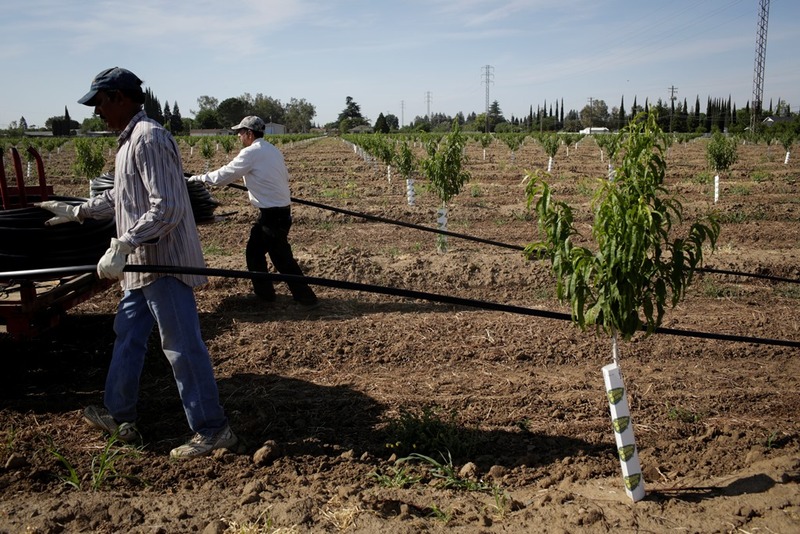 Studies have shown that converting farms to drip irrigation doesn’t necessarily save water. But it does increase food production. Drip irrigation is often touted as the magic wand of water conservation on farms. Switch to drip from sprinklers or flood irrigation, it’s often said, and a farmer can cut water consumption on his crops up to 50 percent. Water managers are looking hungrily at agriculture as California struggles through a fourth year of drought. That’s because farming uses as much as 80 percent of the state’s “developed” water, or water delivered for human purposes. And more than 40 percent of California farmland is still flood-irrigated. That means just what it seems to mean: Water is spilled onto a field from a ditch, then allowed to fill up the field or furrows until you can see clouds reflected on standing water. It seems wasteful — even shameful — when millions of urban Californians are living with timed showers and brown lawns to save every drop of precious water they can. “if we think about population growth and the need to sustain that population, we’re going to need to be getting more out of the water we have,” said Heather Cooley, director of water programs at the Pacific Institute, a think tank based in Oakland (and a member of WaterDeeply.org’s board of advisors). Drip irrigation is a common solution because it is a proven technology, and it seems indisputable that it conserves water. After all, delivering water in pencil-thin tubes directly to plant roots must be better than inundating the entire field. It turns out it doesn’t always work that way. Recent studies have shown that drip irrigation can actually increase water consumption in some farm applications. The primary reason is that drip irrigation allows plants to grow at peak efficiency. As a result, according to a 2008 study in Proceedings of the National Academy of Sciences, total water use may increase. The study examined a portion of the Rio Grande Basin in New Mexico, and found that total water use increased by 36,700 acre-feet per year after a large-scale conversion of farms to drip irrigation. That’s enough to serve some 70,000 homes for a year — not a small amount of water. “Drip irrigation is important for many reasons, including greater water productivity and food security, but does not necessarily save water,” the authors concluded. A farmer who switches to drip irrigation on a tomato field, for instance, will produce more tomatoes than if he used sprinklers or flood irrigation. As a result, the field will see greater evapotranspiration. That means the plants are respirating more water — moving it from the ground, through their tissues and into the atmosphere — and therefore consuming more water in total. This is another big reason drip irrigation is so popular: It increases income on farms. This helps cover the cost of installing drip systems — they’re expensive — and then farmers see a boost in profits. John Diener, a farmer in California’s San Joaquin Valley, says this creates an incentive for many farmers to overirrigate with drip systems. Drip irrigation is so precise that — all else being equal — it almost enables the farmer to ensure a certain profit on the crop. He said this probably amounts to five to 10 percent more water during certain parts of the growing cycle, depending on the crop. In flood irrigation, Howes said, water is usually applied only every 10 to 14 days. But it’s applied in large quantities, so the root zone of plants have access to water for a long time. Any water the plants don’t absorb evaporates into the atmosphere, soaks into the ground or runs off the downstream end of the field. Drip irrigation, in contrast, applies small quantities of water directly to the root zone of individual plants, and the plants absorb nearly all of it. As a result, they have to be watered more often — usually every other day. The result is that total water consumption by the plants increases. Cooley, of the Pacific Institute, doesn’t necessarily view this as a bad thing. Some critics of drip irrigation have another complaint: It eliminates groundwater recharge, a side benefit of the water wasted in flood irrigation. This contribution to groundwater recharge has always been difficult to measure. But it does contribute something, albeit nowhere close to the amount of water initially withdrawn for irrigation. Cooley said this points to larger policy questions. For example, perhaps flood irrigation should only be used where groundwater recharge is needed and also where it can be proven as an effective strategy. Those kinds of questions will emerge as California begins to enforce the Sustainable Groundwater Management Act. The 2014 law requires all groundwater aquifers in the state to be actively managed to avoid depletion. That requirement doesn’t kick in until 2040. In the meantime, groundwater users will be figuring out how and what to irrigate in their particular aquifer region. The result may drive a lot of changes in irrigation technology. Some farmers see an incentive to switch to drip irrigation: They withdraw less water so their wells can recover. Others — perhaps those who have access to surface water — may find that continued flood irrigation makes sense, because the excess sustains the aquifer. Other regions may find that it’s not possible to continue irrigated agriculture at all and sustain groundwater at the same time.